Members and guests of Toxteth Lodge No 1356 gathered at the Geoffrey Hirst Masonic Suite at Woolton Golf Club to celebrate with Robert Griffiths his achieving 50 years in Masonry. After the lodge had been duly opened, the WM asked the brethren to stand to order in respect of departed merit of Arthur Bartley, who having been a staunch and loyal member of the lodge, sadly passed to the grand lodge above in December. 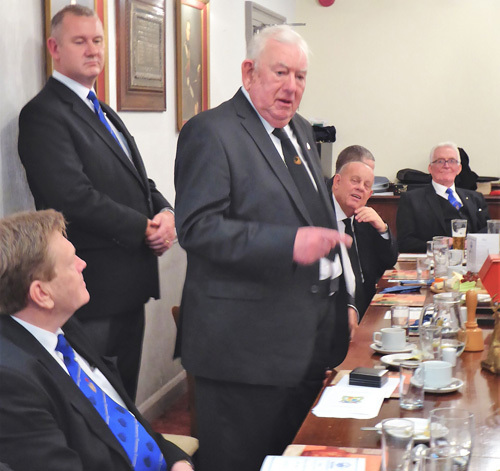 The Provincial Deputy Grand Director of Ceremonies Ian Halsall was admitted and announced that the Assistant Provincial Grand Master Kevin Poynton stood outside and demanded admission. Kevin, accompanied by other grand and acting Provincial grand officers entered the lodge and were warmly welcomed by the WM Stephen Robinson, who then offered Kevin the gavel, which he took as was his right, so that the celebrations could commence. Ian Halsall was asked to place the celebrant Robert Griffiths before him and ensure that he was comfortable, before Kevin proceeded to provide a life history of him. Robert (Bob) Griffiths was born on Sunday 11th April 1937 in Walton Hospital, Rice Lane, Liverpool, to Robert and Ethel Jane Griffiths. Bob’s father was an iron moulder, working for Atkinson and Kirby in Ormskirk and his mother a housekeeper. Bob attended Holy Trinity School in Richmond Park and aged 11 years moved to Anfield Secondary Modern, finishing his education at the Mount Institute in South Liverpool. After leaving school, Bob got his first job with Williams Richard Timber Merchants, in Boundary Road, where he was employed as a clerk and stayed with the company for three years, prior to being called into the Royal Army Pay Corps. He completed his basic training in Northampton and then moved to Devizes in Wiltshire. His first job was in the accounts department where he was quickly promoted to account inspector and for this he was paid the princely sum of 4 shillings a day (20p in new money). Whilst on home leave, the Suez crisis erupted, but on returning to barracks the place was deserted as they had all been posted. Bob volunteered for a posting to Cyprus, along with everyone else, but only 10 were selected. In January 1958, having finished his national service, he decided to attend the Locarno Dance Hall and this is where he was to meet his wife-to-be Brenda. Having taken the trouble to learn to dance at Campbells Dance School and then, at what some called the best dance school in Liverpool, namely Billy Martins on Derby Lane, Bob swept Brenda off her feet and they were married on Brenda’s 21st birthday at Holy Trinity Church in Breck Road in 1962, over 56 years ago!! Having got married, Bob decided he would like to live in Pensby, so having found a plot of land he waited for his new house to be built, whilst living with Brenda’s mum in Liverpool. Benda and Bob had three children, sadly one of them, Jonathan, tragically died in a car accident. However, they now have three grandchildren. On leaving the army, Bob went back to work at the timber merchants, but unfortunately, they were struggling for work and Bob was let go. He soon found another job working for Canadian Pacific, based in the Liver Buildings. Work lasted two years, before he joined the AA (Automobile Association), based in Derby Square, looking after the membership accounts, but the age of the computer took over and Bob was asked to transfer to Basingstoke, but having worked for them for 15 years and recently moved to Pensby, Bob declined and moved to BAMCO (British American Company), which made animal products and he worked here for two years. After joining another company which made machine parts, Bob was again made redundant and he took up a job as caretaker at Bromborough Civic Centre and in his own words “the best job he had ever had”. Bob was initiated into Toxteth Lodge in January 1969, at the Masonic Hall in Hope Street. At this point Kevin asked lodge secretary Dennis Roberts to read the minutes form 1969. 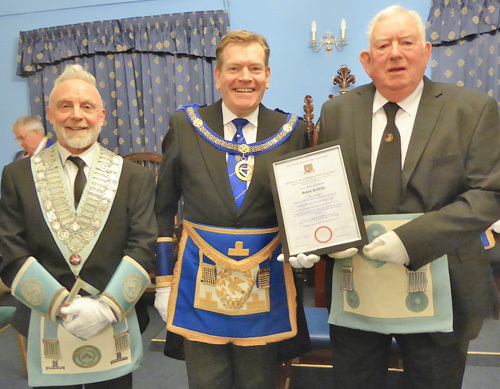 Bob had been on the waiting list to join the lodge for five years, such was the nature of Masonry back then, as the lodge had over 150 members, so it took many years for Bob to even become a steward. Bob was passed to the degree of a fellowcraft in February 1969 and the following month was made a master Mason. For various reasons Bob was unable to regularly attend the lodge, but at nine o’clock on the lodge night he always raised a glass to his lodge. Kevin reminded the brethren of a saying by Elbert Bead, who wrote “Once a Mason, always a Mason” and that saying rings true. Bringing the celebrations to a close, Kevin asked Woolton Group Chairman Andrew Whittle to read the commemorative certificate. This was then presented by Kevin to Bob. The WM having resumed his place and communications from Grand Lodge completed, Ian Halsall formed the procession to retire. Upon leaving, Kevin was accompanied by Bob. The lodge was closed in due form and the brethren retired to the dining room to partake of liquid refreshment and to continue the celebrations. In response to the toast to his health, which had been proposed by Andrew Whittle, Kevin thanked the lodge for allowing him to lead the celebrations and thanked the acting officers for their support, along with the hard working Ian Halsall, who had kept the evening running smoothly; Kevin also thanked Woolton Group Publicity Officer Colin Roberts and the other members of the Provincial publicity team, reminding the brethren that this Province ranks second amongst the 47 Provinces for the number of articles published, which in turn generates many thousands of pounds of revenue and has a vast number of readers. The WM and members of the lodge presented Bob with a 50 year Masonic pin badge and a Masonic fob watch. In his response to the toast to his health, Bob thanked Kevin for leading the celebrations and the members and guests who had turned out to support the evening. During the evening a raffle was held which raised £171 for charity. It had been a wonderful evening and one that Bob will remember for ever.